iPhone Apps: La notte della Taranta, applicazione ufficiale. Description: this Applications gives informations about one of the biggest folk events of Puglia: la Notte della Taranta. 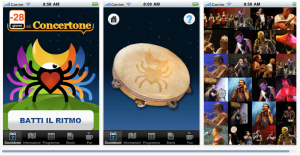 The applications allows to play the original tambourine played during the music events, to send an ecard, to watch a screensaver and to be in touch with all the events related to this folk happening. Successivo Articolo successivo: Siamo tutti mattoni.